A comprehensive all-in-one guide to Lyme disease, including psychological as well as physical symptoms, along with traditional and alternative treatments. Lyme disease is one of the most rapidly emerging infectious diseases in North America and Europe, transmitted to humans by the bite of an infected tick. Symptoms include the classic “bull’s eye” rash, fever, and headache, and current research indicates that 300,000 Americans are diagnosed with Lyme disease annually, ten times higher than previously reported. This indicates a tremendous health problem, heightened by the fact that Lyme disease can manifest not only in physical symptoms, but psychiatric illness such as cognitive dysfunction, memory deficit, and rage issues. 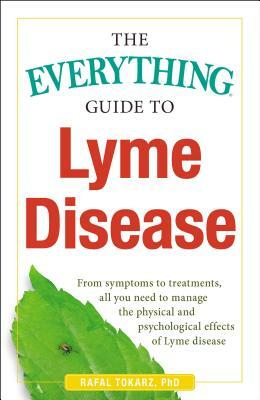 In The Everything Guide to Lyme Disease, you will find the most up-to-date and expert information on all aspects of the disease, including how to prevent it, find the best treatments, and deal with the psychological effects of Lyme disease. Rafal Tokarz, PhD, is an Associate Research Scientist at the Center for Infection and Immunity, Columbia University. His research focuses on microbial discovery and the epidemiology of human infectious diseases, with a primary emphasis on studies of ticks and tick-borne pathogens. Dr. Tokarz earned his PhD at Stony Brook University, prior to becoming a junior faculty member at Columbia University. He has been an author on thirty-six peer-reviewed manuscripts and has worked in the Lyme disease field for sixteen years.